The Lego Ghostbusters can’t really be expected to do their jobs without a place to store all their gear. 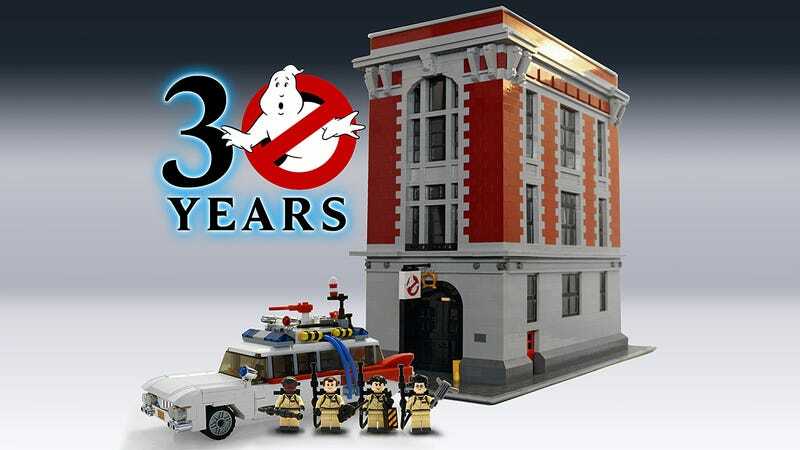 There have been some strong rumors that Lego plans to release a Ghostbusters Firehall set to accompany Brent Waller’s Ecto-1 released last year, and Toys “R” Us may have just finally spilled the beans. The page listing the Lego Ghostbusters Firehouse Headquarters, #75827, is still up on the Toys “R” Us Canada website, including a $400 CAD price tag which is still pretty hefty when converted to US funds. There’s no info on whether this new set will be based on Brent Waller’s Lego Ideas submission (pictured above) like the Ecto-1 set was, but it will supposedly come with nine Minifigs including all four Ghostbusters, Dana Barrett, Janine Melnitz, and Louis Tully. (Yay!) It won’t, however, include Ecto-1; you’ll still need to buy that set separately to complete your diorama. Suspend ghosts around the building’s exterior with attachable transparent arms. Dodge the slime oozing up through cracks in the pavement. Measures over 14” (36cm) high, 9” (25cm) wide and 14” (38cm) deep.